Do you remember that talk from your primary school teacher about tectonic plates? What about that time you met a friend of a friend at a dinner party and your eyes glazed over while they told you about their job? This is primarily due to ineffective communication. If the story or conversation had been more engaging, you would be more likely to recall them today. Effective science communication is a key skill that many researchers and academics lack. Building and developing those skills will not only make you a better scientist, they'll also make you less boring at a dinner party! Here are five key pointers to remember the next time you’re talking to someone about science. In science communication, a strong start will definitely go a long way. The first few sentences are used as a hook, a way to capture the audience’s attention. People will only pay close attention if you cause them to care about your topic. So, the speaker needs to set a very clear scenario that conveys the topic, the challenge being addressed and its relevance to the audience. However, at this initial stage, creativity is still key and there is no real rule as to what the hook should be. In some cases, the way you deliver a message can also help people remember it better. Next time, why not try poetry, spoken word or even singing? Maybe bring some props with you? These are all examples of things that will make your pitch unique, quickly capture your audience’s attention, and make your take-home message memorable. Now that people are listening to you, how do you keep their attention until the end? First, you need to know your audience and adapt to them. It is always good to know in advance how big is your audience, their age range and their background. Adapting comes down to using the right language (try not to use technical jargon! ), analogies and relatable examples. Technical terms are allowed only when they’re essential to your take-home message and can easily be explained. Once you know your audience, it’s time to build a story around your topic. A good story is structured and focused, and guides the listeners straight to the end. If you think the audience might get bored, why not add some mid-story hooks? Bring in more props! Maybe draw that thing you’re finding hard to explain. Sometimes, scientific topics carry too much gravitas to them. A joke here and there lightens the mood and makes people feel more comfortable. Don’t be afraid to get the audience involved - people love interactive talks. Ultimately, don’t be scared to mix it up a bit. It can have a profound effect on your audience and help communicate your message. Think outside the box! The old saying goes "practice makes perfect". Well, practice makes it clear in science communication. When you are presenting a complex idea, it can get bogged down in the technical details. Some of the best feedback you can get is from someone without a scientific background. It can be tricky to get someone to "volunteer", people can be reluctant to sit and be "bored" by science! But you can always lure them with the promise of chocolate! Question #1: "What did you learn?" – This is to ensure that you stay on message. Question #2: "Did your attention waver at any point?" – This is to ensure you maintain the focus of your audience. The responses can be brutal, but those honest answers will be the most useful. Keep those answers in mind when you revise your talk. Improvisation is a good tool but preparation is better, especially if you have a solid foundation and good understanding of the key points you need to hit to be clear. One of the challenges in communicating science is that even if an idea is communicated well, it will still get a "why should I care?" response. Motivation is a way to engage the audience: why is this important? This can be easy to communicate if you make the topic relatable to the audience and how it affects their life. If something makes the Internet faster, their commute quicker or fixes a medical problem, people pay attention. So the key thing to remember when communicating science is to keep in mind how it impacts the audience. It can be a lot harder to communicate when it is an abstract concept that doesn’t directly affect the audience. This is an opportunity to explain motivation of the researcher. Ask "why did the physicists look for the Higgs Boson?" rather than "what is the Higgs Boson?". This will naturally lead to the importance and impact of the research. If you try to communicate the "why?" of the research, it will help convey the impact of the innovation. Lastly, it’s very important that you convey ONE key message to your audience. 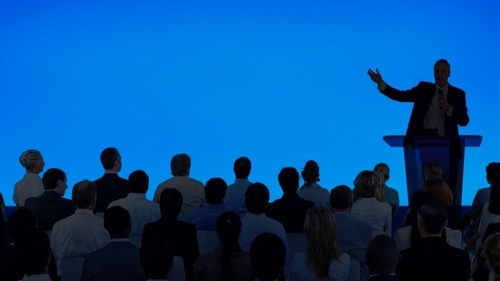 It is critical that you nail down the take home message throughout the presentation. Repetition, when done artfully, can be a very useful strategy. Finally, there’s no cookie cutter template to being an effective science communicator. Different techniques and strategies work for different people. These are just five key areas that we think are critical to get right when crafting your story. Follow these tips and you won’t be the boring dinner guest! Dr Diana Gaspar is a postdoctoral researcher at the Regenerative, Modular & Developmental Engineering Laboratory (REMODEL) at NUI Galway working on the development of cell therapies for tissue regeneration. She is a former Irish Research Council awardee. Dr. Peadar Rooney is a postdoctoral researcher in biomaterials and translational medicine at the Centre for Research in Medical Devices (CURAM) at NUI Galway and his research is focused on developing novel biomaterial-based medical devices for the treatment of interstitial cystitis and creating the perfect taco. Joshua Chao is a PhD student in the Regenerative Medicine Institute (REMEDI) at NUI Galway focused on investigating the role of endogenous stromal cells in critical limb ischemia. He is also a venture coach with the campus entrepreneurship programme Blackstone LaunchPad. He is a former Irish Research Council awardee.